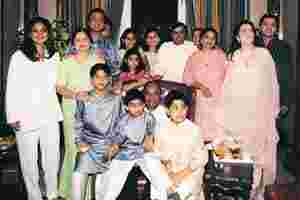 A file photo of entire Ambani family. Business families continue to dominate the Indian landscape. There is almost a whiff of feudalism in many of the old firms, as the sons and daughters of the ruling family waltz into the top jobs after a short time as a cog in the machine. Many have foretold the death of such arrangements. Yet, firms run by families have shown remarkable resilience since liberalization. While some of the older business families such as the Mafatlals, the Lalbhais and the Modis have gone into relative decline, others such as the Tatas, the A.V. Birla group and the Ambanis have --- despite many bumps along the road --- done well for themselves. Meanwhile, new family firms have emerged: the Bharti group, the GMR group and the Future Group, for instance. One explanation is that firms led by families tend to have a longer investment horizon and their capital tends to be patient, perhaps because they have an incentive to hand over a stable business to the next generation. Some of the best bets in Indian business in recent years have been taken by the likes of Ratan Tata, Mukesh Ambani and Anand Mahindra. Many of these bets have been extremely risky at first, and it is worth asking whether these risks could have been taken by a pure professional manager (though there are the rare cases to disprove this point, such as the transformation of ICICI by K.V. Kamath). In a recent interview with Mint, Dwijendra Tripathi, the doyen of Indian business historians, said that the future of family businesses in India is bleak. “After half a century, and this is an overestimation, no one will talk about family businesses in India." The scion of one of the largest business families in India once told me that there is change in the air. The younger generation no longer has the perseverance to actually run an industrial operation that way someone like Rajiv Bajaj does; most would prefer to act as private equity investors and manage government relations. It is too soon to say whether this will indeed happen, but there is a strong case for business family to change the nature of their role in the companies they control. Will Indian business families eventually change, becoming capital allocators rather than actual managers?